Fourteen states have legalized medical marijuana. Internists who have issued the controversial prescriptions describe how they sort out legitimate uses from trivial requests. That statins work is without question. And with costs falling due to many drugs in the class going generic, physicians are now refining when to prescribe the ubiquitous drug class based on the degree of risk. Erin N. Marcus, FACP, authors a practical health column directed to readers who don't have enough financial resources or access to care. 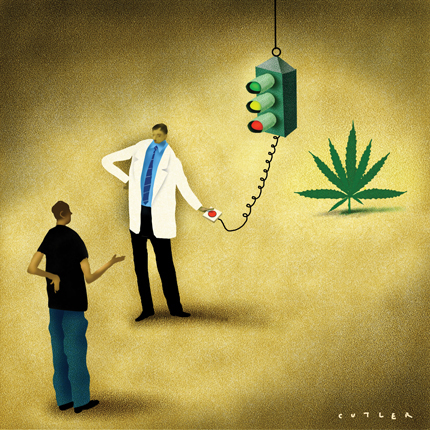 A first look at issues that aren't cut-and-dried on the surface: when to prescribe medical marijuana, and when to prescribe statins. For both issues, the devil is in the details. Readers take issue with recent coverage of health care reform, a profile on Cuba's health care system, and the promise that electronic health records may (or may not) have in the practice of medicine. A serious bi-partisan discussion is needed to make serious decisions about health care reform. An outpatient family practice clinic tries to reduce wait times by letting patients direct themselves to open exam rooms. As a result, wait times fell by half and patient satisfaction rose to its highest levels in 11 months. The White House's national coordinator for health information technology offers advice on implementing and using electronic health records, and specifics on the incentive program that promises more reimbursement for adopters. Developments at the Centers for Medicare and Medicaid Services will benefit those who want to quit smoking, but will also increase audit scrutiny over physician and facility claims. A 44-year-old man is evaluated for a 2-year history of joint pain in the wrists, hands, knees, ankles, and feet. He also has a 12-year-history of plaque psoriasis. There are large erythematous plaques with an overlying silvery scale on the elbows, knees, sacrum, and scalp. The wrists are swollen and warm bilaterally, and there is bilateral synovitis of the metacarpophalangeal joints. There are effusions on both knees. The appearance of the toes is shown. The patient refuses to begin therapy with tumor necrosis factor ##alpha; inhibitors because of concern about possible side effects. What is the most appropriate treatment for this patient?.